Easy Hosting Control Panel (EHCP) is a free and open source control panel written in PHP, which can be used to host your websites on your virtual private server. Easy Hosting Control Panel provides a simple and easy to use interface, for creating and managing users, websites, MySQL databases, DNS management, ftp and email accounts, and much more. In this tutorial, we will show you how to install the Easy Hosting Control Panel on Ubuntu 16.04. Let’s get started. The installation script will install all the necessary packages and services. We will go through all the required steps and make sure the installation is completed properly. During the installation process please read and follow all the instructions carefully. Let’s start by pressing Enter to continue. Now, ehcp pre-installer begins, a series of operations will be performed and main installer will be invoked. Please keep in mind, Ehcp 0.38.3 and later is for Ubuntu 16.04 and later. Ehcp is specifically tested for Ubuntu, but should also work on many Debian based distros. Note that ehcp can only be installed automatically on Debian based Linux OS'es or Linux'es with apt-get enabled..(Ubuntu, Kubuntu, debian and so on) Do not try to install ehcp with this installer on redhat, centos and non-debian Linux's... To use ehcp on no-debian systems, you need to manually install.. Note that, this is just a utility.. use at your own risk. Starting Ehcp install, please read prompts/questions carefully ! You will then be asked to either enter a new or leave the password for the MySQL “root” user unchanged. You will also be asked to enter your name, email address and set up the MySQL and admin user password for the “ehcp” account. Make sure you replace STRONGPASSWORD with an actual strong password. THIS SECTION IS VERY IMPORTANT FOR YOUR EHCP SECURITY AND PASSWORD SETTINGS. Enter your hostname, IP address, preferred language etc. If you want to leave defaults, just press Enter. In my case, I go with defaults. At some point during the installation you will be asked to configure the roundcube database. Press “Yes” and then enter a password for the roundcube database user. The database for phpmyadmin also needs to be configured. When asked about it, select “Yes” and then enter a password for the phpmyadmin database user. After you enter the password you will also be asked to choose the web server which will be configured to run phpMyAdmin. Since we have an Apache web server on our VPS we chose the “apache2” option (you can press SPACE on your keyboard to choose which server you would like and then press OK). Next, we need to select the mail server configuration type based on our needs. In our case, we went with the default one “Internet Site” option. We also need to enter the mail name of the server. This name should be a fully qualified domain name (FQDN). Lastly, you will be asked to create directories for web-based administration. Select “Yes” to continue. ehcp install finished up to now. we are continuing on simplifying the install process. you may join us in developing this control panel. 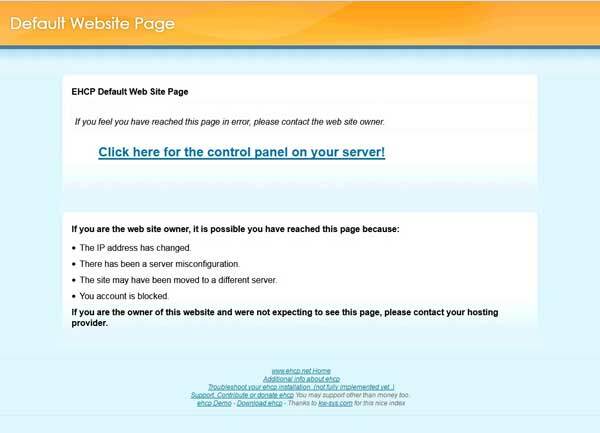 This will take you the EHCP login screen. You can log in using “admin” as username and the password you have set during the installation. If you haven’t set any password you will need to use the default one “1234”. That’s it. EasyHosting Control Panel has been successfully installed on your Ubuntu 16.04 server. We can install, configure, set up and optimize Easy Hosting Control Panel on Ubuntu 16.04 for you if you are one of our Linux server support customer. Our expert Linux administrators are available 24×7 and will take care of your request immediately. PS. 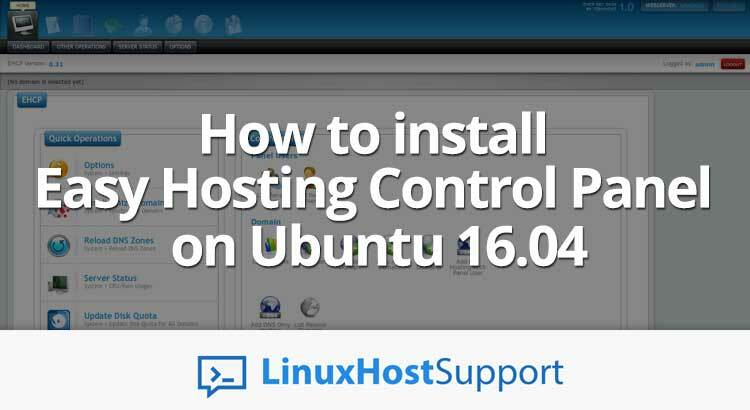 If you liked this post on how to install Easy Hosting Control Panel on Ubuntu 16.04, please share it with your friends on the social networks using the buttons on the left or simply leave a reply below. Thanks.